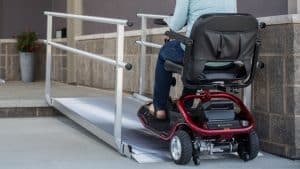 Semi permanent home ramps are the best solution for providing greater and safer access to people using wheelchairs, scooters, or other mobility aids where a portable or permanent wheelchair ramp is impractical. Orthopedic Service Company provides customers in Chapel Hill, NC with semi permanent home ramps that are easily installed at home, come in a wide variety of shapes and sizes meant to fit any specific requirements, and handle all types of wheelchair access necessary. Semi permanent home ramps can be used temporarily. Holding a modular construction makes it possible for them to be adjusted in length, all while providing handrails when necessary. Working with the best brands in the market, Orthopedic Service Company brings semi permanent home ramps that are useful, safe and durable for residents in Chapel Hill, NC. In order to assure the highest of quality standards, we only work with ADA compliant semi permanent home ramps, guaranteeing that they all meet OSHA and IBC2006 guidelines, and making sure to provide the best there is in terms of safety and quality. Since they can be easily modified, adapted, and reused, semi permanent home ramps provide a convenient alternative to concrete ramps. Their durable construction and finish is guaranteed to resist years of outdoor use while acting as the access solution that you’re looking for at a fraction of the cost. When looking to acquire a semi permanent home ramp, Chapel Hill, NC residents will be glad to know that Orthopedic Service Company offers the best possible customer service. Complete with an assessment of your mobility and access situation, our team of mobility experts work alongside you to select the right ramp that exactly fits your needs. Contact us today and start paving the way to a more accessible home.